Your purchase helps support our mission to preserve West Park history. Thank you! FROM ROCKPORT TO WEST PARK. 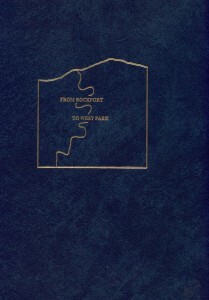 The formation of early Rockport Township is traced from the early 19th century until it is partitioned into Rocky River, Lakewood, Fairview Park, and West Park. 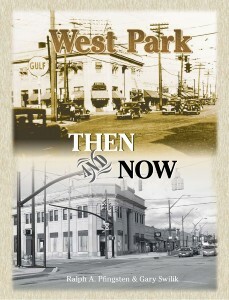 The second half of the book is devoted exclusively to West Park and its development decade by decade to the present day. 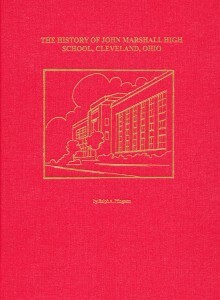 THE HISTORY OF JOHN MARSHALL HIGH SCHOOL, CLEVELAND OHIO. West Park High School opened its doors in 1899 in the city with the same name. In 1923 the city of West Park became part of the city of Cleveland as did its school system. The book traces every aspect of high school life from 1899 into the 1990s. Chapters include an all-time faculty list, graduating class sizes and valedictorians, academic classes, music & drama, athletics, Hall of Fame members and much, much more. 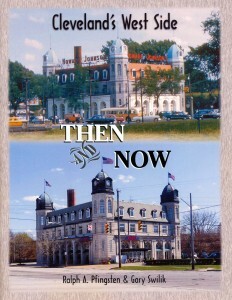 THEN AND NOW IN WEST PARK. by Ralph Pfingsten and Gary Swilik. 2009. 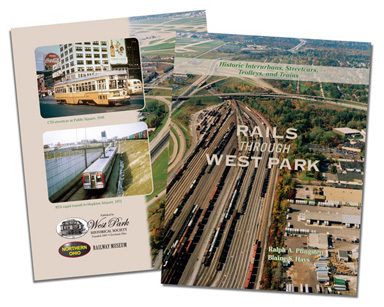 Focuses on the once independent City of West Park which included all of Cleveland’s far West Side. Packed with over 150 recently discovered then-and-now photos of local families, neighborhood stores, old theaters, lost scenes and forgotten places. 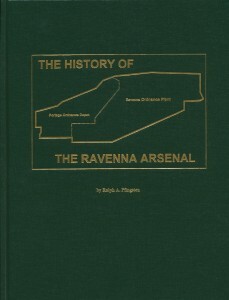 A comprehensive book by historian Ralph Pfingsten that covers the wondrous history of the Ravenna Arsenal. It is a WWII munitions production facility that has been shrouded in mystery since its creation in 1940. It covers the history of the arsenal in detail from inception, its past service to our country, and present uses. Also documented is the related Plumbrook facility near Sandusky. This book is your chance to peer inside the arsenal’s security fences and see what secrets these formerly classified military facilities possessed. 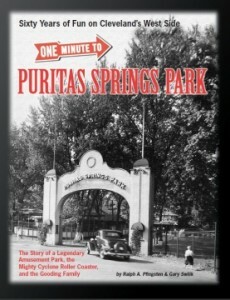 ONE MINUTE TO PURITAS SPRINGS PARK: SIXTY YEARS OF FUN ON CLEVELAND’S WEST SIDE. by Ralph Pfingsten and Gary Swilik. 2011. This is first comprehensive history of the only major amusement park on Cleveland’s West Side with two-hundred pages of rare photos, ads, memories and interviews. Detailed chapters on the park’s origin from a spring-water bottling plant to an early interurban “Trolley Park” and eventual amusement park are included. In addition, the dance hall, roller rink, merry-go-round, and more, are covered including an in-depth analysis of the myths and legends surrounding the parks fearsome Cyclone roller coaster. Color and black-white photos, most never-before-published. 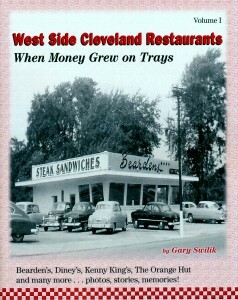 THE WEST SIDE CLEVELAND RESTAURANT SERIES by Gary Swilik. Purchase all four volumes for $50. WEST SIDE CLEVELAND RESTAURANTS VOL I: WHEN MONEY GREW ON TRAYS. 2010. Tells the stories of many of the most popular restaurants on the West Side including Bearden’s and their peanut-burger, Diney’s and the secret ingredient that made their steakburgers a taste sensation, Kenny King and his Big King Steakburger, and Regnatz Dining Hall, a combination of country club, restaurant, and park. Learn how a failed custard stand on Lorain Avenue was transformed into The Orange Hut and discover where one of the Cleveland’s very first drive-in restaurants still stands, nearly forgotten, on Bellaire Road. Over 125 photos, menus, and old ads, many never-before-published. 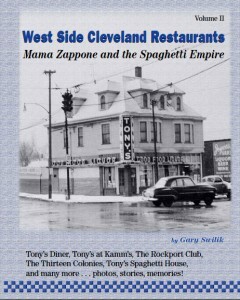 WEST SIDE CLEVELAND RESTAURANTS VOL II: MAMA ZAPPONE AND THE SPAGHETTI EMPIRE. 2011. Covers the real-life saga of Josephine “Mama” Zappone who, in 1928, found herself widowed and deeply in debt, with seven children still at home. To support her family she served home-made spaghetti dinners from her house. She and her family went on to build a restaurant empire which included Tony’s at Kamm’s Corners, Tony’s Spaghetti House, Mr. Z’s, The Thirteen Colony, and the legendary Tony’ Diner. More than 90 photos, menus and old advertisements. WEST SIDE CLEVELAND RESTAURANTS VOL. III: FIT FOR A KING. 2012. 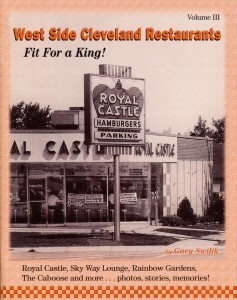 Features the Royal Castle restaurant chain, fondly remembered throughout Northeastern Ohio. At the dawn of time, before McDonald’s and Burger King, the Royal Castle hamburger, served with an ice-cold Birch Beer in a frosted glass mug, ruled supreme! Also includes chapters on legendary eateries like the Sky Way Lounge, Kathleen’s Kitchen, The Caboose and more. Over 100 rare photos, advertisements and menus. 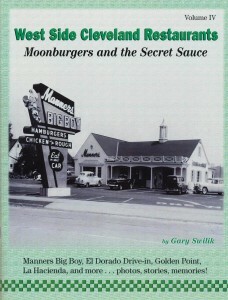 WEST SIDE CLEVELAND RESTAURANTS VOL IV: MOONBURGERS AND THE SECRET SAUCE. 2013. With the cooperation of the Manners Family, the inside story of Bob Manners and his famous restaurants are told for the very first time. Critics said a drive-in restaurant would never work in a wintry northern city but Bob proved them all wrong. Manners Big Boy hamburger, with the Secret Sauce, was a “meal in one on a double-decked bun” and it helped build Manners into one of the biggest restaurant chains in Northeast Ohio. Also includes chapters on the El Dorado Drive-in, Golden Point Hamburgers, and more, with rare photos, interviews, and old ads. CLEVELAND’S WEST SIDE: THEN AND NOW. by Ralph Pfingsten and Gary Swilik. 2013. A photographic celebration of Cleveland’s West Side from Public Square to the cliffs of Rocky River Valley. Old photos laid side-by-side with current images. Detailed descriptive captions. Street scenes, stores, theaters and landmarks. Over 140 total photos, many never-before-published. Large format, glossy color cover.